Monosacharaides can further be classified into aldose & ketose. If the monosaccharide  contain an aldehyde group (-CHO), it is known as aldose. E.g., glucose. Monosacharides which contains a ketone group (>C=O) then it is known as ketoses. E.g.,fructose. All the monosaccharides are reducing sugars as all of them have free functional group which can reduce Tollen’s reagent . Monosaccharides are also classified on the basis of number of carbon atoms present in its chain. D and L Terminology:  The simplest of all carbohydrates that fit the definition we have given for carbohydrates are the trioses, glyceraldehyde and dihydroxyacetone. Glyceraldehyde is aldotriose, and dihydroxyacetone is a ketotriose. Glyceraldehyde contains one asymmetric carbon atom (marked by an asterisk) and can thus exist in two optically active forms, called the D-form and the L-form. Clearly, the two forms are mirror images that cannot be superimposed, that is they are enantiomers. The two forms of glyceraldehyde are especially important because the more complex monosaccharides may be considered to be derived from them. They serve as a reference point for designating and drawing all other monosaccharides. In carbohydrate chemistry, the Fischer projection formulas are always written with the aldehyde or ketone groups at the top of the structure. By definition, if the hydroxyl group on the asymmetric carbon atom farthest from aldehyde or ketone group projects to the right, the compound is a member of the D-family. If the hydroxyl group on the farthest asymmetric carbon projects to the left, the compound is a member of the L-family. The maximum number of optical isomers of a sugar is related to the number of asymmetric carbon atoms in the molecule and may be calculated by the following simple equation. Maximum Number of Optical Isomers = 2n, where n = the number of asymmetric carbon atoms. Since glyceraldehyde contains only one asymmetric carbon atom, the number of optical isomer is 21. We know that 21 is = 2, and we have seen that there are indeed two different glyceraldehydes. All four isomers have been prepared synthetically. The D- and L-erythrose are mirror images, that is, they are enantiomers. They have exactly the same degree of rotation but in  opposite directions. Equal amounts of the two would constitute a racemic mixture, that is, a mixture that would allow a plane-polarised light to pass through the solution unchanged but could be separated into detrorotatory and laevorotatory isomers. The same comments  hold for D- and L-threose. However, D-erythrose and L-threose are not images, that is, they are diastereomers (optical isomers that are not mirror images are called diastereomers), and the degree of rotation of each would probably differ. ?If we examine the general formula of an aldopentose, we see that they contain three asymmetric carbon atoms. This means that 23 or 8 optical isomers are possible. 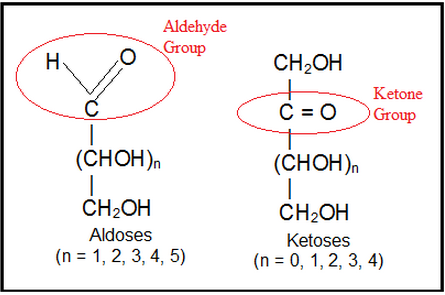 If we examine the general formula of aldohexose, we see that it contains four asymmetric carbon atoms. Only three of the sixteen possible aldohexoses are found in nature (all sixteen isomers have been prepared synthetically). They are D-glucose, D- mannose, and D-galactose. No one of these three optical iosmers is a mirror image of any of the others, so all three are diastereomers of each other. Since monosaccharides contain a number of hydroxyl groups and an aldehyde or a keto group, therefore, any one  of  the  –OH groups (usually C4 or C5 in aldohexoses and C5 or C6 in ketohexoses) may combine with the aldehyde or the keto group to form intramolecular hemiacetal or hemiketal. 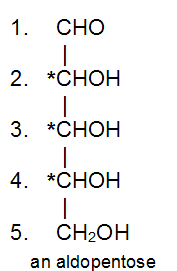 As a result, the open chain formulae do not represent the actual structures of the monosaccharides. Their actual structures are cyclic involving five or six membered  rings  containing  an  oxygen  atom. 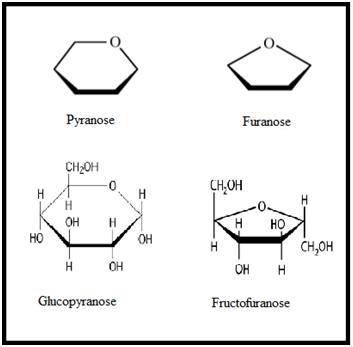 The five membered ring containing one oxygen atom because of its similarity with furan is called the furanose form and the six membered ring containing one oxygen atom because of its resemblance with pyran is called the pyranose form. In nut shell, all the monosaccharides (pentoses and hexoses) in the free state always exist in the pyranose form. However, in the combined state some monosaccharides such as ribose, 2-deoxyribose, fructose etc., usually exist in the furanose form. In a-D-glucose, the OH group at C1 is towards right while in b-D-glucose, the OH group at C1 is towards left. Such a pair of stereoisomers which differ in configuration only around C1 are called anomers and the C1 carbon is called Anomeric carbon (or glycosidic carbon. 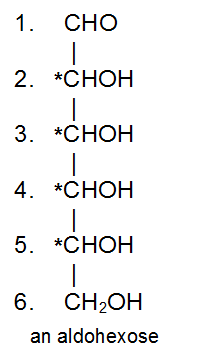 The cyclic structures of monosaccharides can be better represented by Haworth Projection formulae. To get such a formula for any monosaccharide (say a-and b-D-glucose), draw a hexagon with its oxygen atom at the upper right hand corner. Place all the groups (on C1, C2, C3 and C4) which are present on left hand side in structures I and II, above the plane of the ring and all those groups on the right hand side below the plane of the ring. The two stereoisomeric forms of glucose, i.e., α-D-glucose and β-D-glucose exist in separate crystalline forms and thus have different melting points and specific roations. For example α-D-glucose has a m.p. of 419 K with a specific rotation of +112° while  β-D-glucose has a m.p. of 424 K and has a specific rotation of +19°. However, when either of these two forms is dissolved in water and allowed to stand, it gets converted into an equilibrium mixture of α-and β-forms through a small amount of the open chain form. As a result of this equilibrium, the specific rotation of a freshly prepared solution of α-D-glucose gradually decreases from of +112° to +52.7° and that of β-D-glucose gradually increases from +19° to +52.7°. This change in specific rotation of an optically active compound in solution with time, to an equilibrium value, is called mutarotation. During mutarotation, the ring opens and then recloses either in the inverted position or in the original position giving a mixture of α-and-β-forms. All reducing carbohydrates, i.e., monosaccharides and disaccharides (maltose, lactose etc.) undergo mutarotation in aqueous solution. (a) With HI/P: It undergoes reduction to form n-hexane while with sodium amalgam it forms sorbitol. (f) With Tollen reagent and Fehling solution: Glucose forms silver mirror and red ppt. of Cu2O respectively. (g) With acetic anhydride. In presence of pyridine glucose forms pentaacetate. 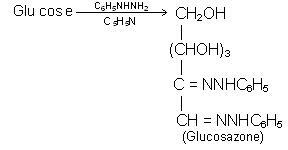 (j) Glycoside formation: When a small amount of gaseous HCl is passed into a solution of  D (+) glucose in methanol , a reaction takes place that results in the formation of anomeric methyl acetals. 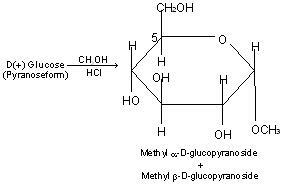 (j)  Glycoside formation: When a small amount of gaseous HCl is passed into a solution of  D (+) glucose in methanol , a reaction takes place that results in the formation of anomeric methyl acetals. Carbohydrate acetals, generally are called glycosides and an acetal of glucose is called glucoside. 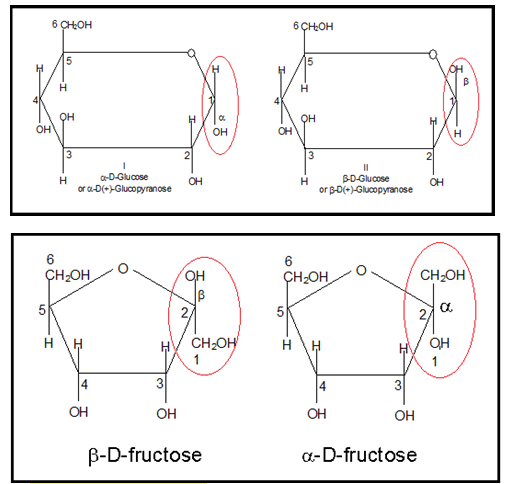 the structure of glucose and fructose differ only in those carbon atoms which take part in asazone formation. This is a method of lengthening the carbon chain of an aldose. To illustrate, we take synthesis of D-threose and D-erythrose (Aldotetroses) from D-glyceraldehyde (an aldotriose). Addition of HCN to glyceraldehyde produces two epimeric cyanohydrins because reaction creates a new stereocenter. The cyanohydrins can be separated easily (since they are diastereomers) and each can be converted to an aldose through hydrolysis, acidification and lactonisation, and reduction with Na—Hg in presence of H2SO4. 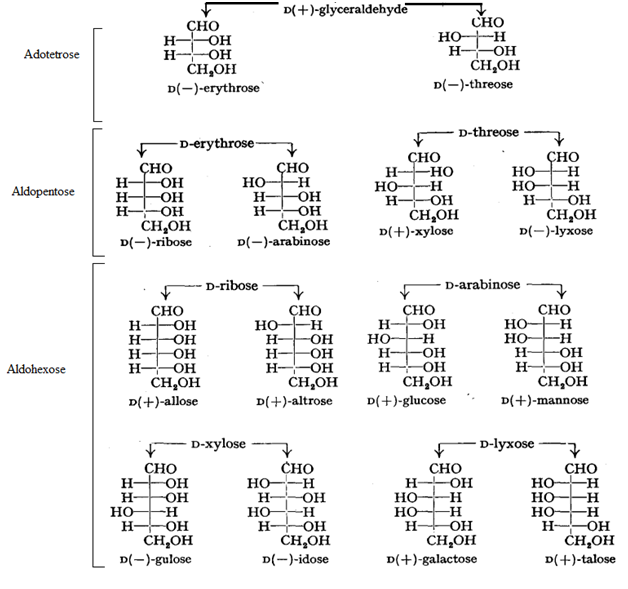 One cyanohydrin ultimately yields D-erythrose and D-threose. 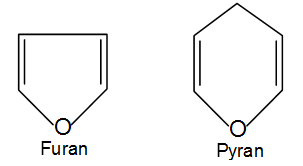 D-glyceraldehyde and its stereocentrer is unaffected by its synthesis. It is opposite to Kiliani Fischer synthesis that can be used to shorten the chain by a similar unit. The ruff degradation involves (i) Oxidation of the aldose to an aldonic acid using Bromine water. (ii)Oxidative decarboxylation of the aldonic acid to the next lower aldose using H2O2 and Fe2(SO4)3. D-ribose for example can be reduced to D-erythrose. 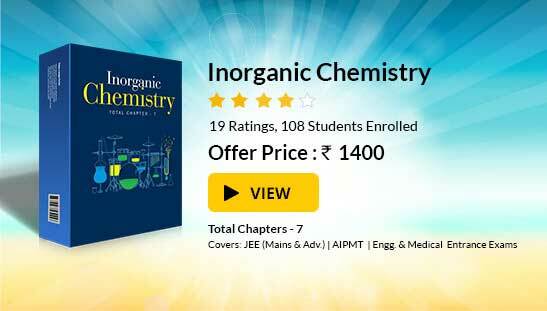 To read more, Buy study materials of Biomolecules comprising study notes, revision notes, video lectures, previous year solved questions etc. Also browse for more study materials on Chemistry here.